Enclosed in a ten-by-ten home office for six to eight hours a day, Expert Author Norman Wilson researches, drafts, and polishes his articles. With ideas sparked by chance conversations, newscasts, television programs, magazines, books, and the Internet at large, Norman writes insightful, thought-provoking articles from politics to education to sociology. 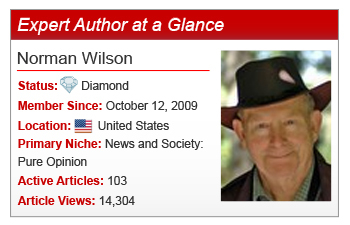 Author of over 200 articles, several college textbooks, three novels, and two non-fiction books, it’s difficult to believe Norman was once a “struggling writer.” Advised to build a platform and to enhance his brand with article writing, Norman chose to publish with EzineArticles after reading articles from fellow Expert Authors and liking what he read. “And with that began a very pleasant and positive experience,” Norman said. What were your biggest article writing challenges? One of the fundamental problems of article writing is the amount of time it takes. One has to make a judgment about the time it takes to write articles against the time to work on a novel, for example. The biggest challenge for me was to learn the style, format, and demands of the publisher. Each has its own system and preferences. Another challenge, and this is very personal, is to accept the fact that everything I write will not necessarily be published and will be read. It’s very easy to get caught up in one’s ego. The real challenge is to make my writing interesting to a wide range of readers. What’s your favorite technique to overcome writer’s block? The creation of the draft is really the major workout… I’ve used the following technique for many years. I take the last page or two of what I have written and begin keyboarding it over again, just as it is. At the end of that, I generally find myself starting a new paragraph and the work flows from there. In addition to that, I have a very demanding boss. Her name is Lucy and she goes to my office door and yells at me to come and get to work. Lucy is a sliver colored cat. Once I am back at my computer, she settles down for the duration. In his closing remarks, Norman shared this last piece of advice for fellow Expert Authors: “If you need help, ask for it. You will get it.” We couldn’t agree more! Take Norman’s advice: get involved, ask questions, and start building your recognition today. Do you have a question or comment for Norman? Feel free to leave it in the comments section below. That is inspiring to read of such a prolific author when you sound like a down to earth guy. Do you have any tips for those of us that enjoy writing and would like to write a novel but have full time work schedules? I’m not one to miss out on a good night’s sleep either!! Am I doomed? Procrastination is every authors worst enemy. Use a notepad and jot down ideas as the day progresses. At the end of the day check if they can be organized into a pattern. As you move along from day to day, you will have a good start on your novel. Good luck. Great encouragement, Norman. This is what I need to know as a beginner. Everyone is a beginner at sometime. Without those of you who take the first step we’d be at a loss for some great new reads. All of us have dozens of rejection slips. All that means is you having met the right publishing mate for your genre. Congratulations dear Norman! This article only scratches the surface of the true you! I am really happy for you, you so deserve this and so much more!!! Hi Norman, congrats on the publicity. Keep up the good work! Thank you Randall. I appreciate you taking the time to stop by with a nice comment. I am impressed that you alternate between writing your novels and writing articles – not a bad idea because it stops you from getting stuck. I also liked the way you described your beginning- keying in something youve already written and then that gets your mind flowing and your writing continues from there. Thank you Dr. Erica for taking the time to comment. Writing articles, especially for EzineArticles, is a great way to build platform. Norm is the best, as is Suzanne! His advice is solid for this new writer and I have taken this to heart by working within the framework of a draft I am proud of. The draft plants the seed that creates the treads. Norman I guess you have been writing for a long time. I am having trouble just getting started on writing articles and blogging. I bet you have some good tips and advice for someone just starting out in the business. I enjoyed your article and especially hearing about your boss. Too cute. Personally, the biggest article writing challenges to me is overcoming laziness.